Born on 27 May 1878, in San Francisco. Isadora was the fourth child of Mary Dora and Charles Duncan, a suspected embezzler who later deserted his family. Life was hard and Isadora, her mother, brother and sister had to survive on their mother’s piano teaching. They were a talented family and Isadora and his sister Elizabeth, naturally dancers, supplemented the family income by giving class­es to local children. How ever, the family elected to go east to find professional work. Despite auditioning with vast self-belief, Isadora had no luck until Charles Fair manag­er of the Masonic Roof Garden, offered her a place in his vaudeville show. After three weeks she refused to tour with the show. Luckily; Augustin Daly*, one of the great theatrical managers, saw Isadora dance in Chicago and engaged her for his show in New York. *Daly, John Augustin (1838-1899) — American playwright and theatrical manager. She had a small part in a pantomime called Miss Pygmalion. After three weeks the company went on tour, but it was a dismal fail­ure. Back in New York, Daly offered Isadora a part as a fairy in A Midsummer Night’s Dream and, in January 1896, she first danced professionally on a real stage. Daly sent the company to tour England in the spring of 1897. By autumn the tour was over and Isadora returned to New York and resigned from the company in order to con­centrate on her own ideas. Isadora wanted to dispense with scenery and elaborate costumes and return to the roots of dance. She would discard the tutu and ballet shoes, as well as the corset, and per­form in bare feet and Greek tunic. Ethelbert Nevin*, a composer, was a neigh­bour and Isadora began to perform to his work. *Nevin, Ethelbert Woodbridge (1862-1901) — American com­poser. He was so keen that he arranged a dual concert in the Carnegie Hall Music Room in March 1898. The controversial success of this show al­lowed the Duncans to more into the Wind­sor Hotel. No sooner had they set up their new home, than the whole hotel burned down, destroying most of their possessions. Isadora was convinced that it was time to move to Europe for good. The Duncans managed to get a free passage on a cattle-boat. On their arrival, they found no work and ran out of money. Just when their spirits were at their lowest, Isadora and her brother Raymond got an introduc­tion to a leading society lady, Mrs George Wyndham, At Mrs Wyndham’s Isadora met Charles Halle* and she knew that her for­tunes had changed at last. *Halle, Sir Charles (1819-1895) — British pianist and con­ductor. Director of the New Galley in Regent Street, Halle conceived a place for a series of performances. For these “Evenings with Isa­dora Duncan” he enlisted his friends to give lectures on art and culture. The first per­formance was held on 16 March 1900. In spring 1901 Isadora and Halle met again. He introduced her to a number of influen­tial people. Isadora danced in a salon the pi­ano accompaniment of 26-year-old Maurice Ravel*. *Ravel, Joseph-Maurice (1875-1937) — French composer. At 23 she was achieving a certain amount of fame and financial success. Despite being quite well known she was op­posed little professional work, but as the end of 1901, she was invited to tour the German-speaking countries with Loie Full­er*, another power of modern dance. * Fuller, Loie, orig. Marie Louise (1862-1928) — American dancer, inventor of serpentine dance; also made innovations in theatrical lighting and costuming. This was a great coup for Isadora, and led to her meeting the Hungarian impresario Alexan­der Gross in Vienna. He offered her a 70- minute run at the Urania Theatre in Buda­pest, which she accepted at once. After successfully fulfilling this contract, she returned to France, convinced she could conquer Paris. She was again received with enthusiasm. Distressed, she decided to take her family to visit the country of her most cherished artistic inspiration-Greece. After a series of cultural and artistic ex­periments in Greece Isadora travelled through Europe, stopping in Vienna, and Berlin. On 14 December 1904, Gordon Craig*, the progressive English stage design­er arrived in Berlin, visited Isadora and watched her dance. * Craig, Edward Gordon (1872-1966) — English actor, stage designer and producer. They fell in love. This eventually began at the end of January 1905. Her brief experience of Russian classical ballet convinced Isadora that her style of dance was right. After a brief visit to Kiev and Moscow, she hastened back to Berlin, where she was determined to set up a school and prove her theories. After another tour of Russia, Isadora real­ized that her school would never succeed. She closed, and left for Paris with her twelve most promising pupils. Her visit coincided with the first season of the Ballet Russees, which outshone her. Faced with this she decided to go to London. She performed with her pupils at the Duke of York Theatre and was then invited to dance in New York for the first time since 1899. She was a dismal failure. To recover she went on tour where she met Walter Damrosch*, conductor of the New York Sym­phony Orchestra, who offered her collabo­rative venture. * Damrosch, Walter Johannes (1862-1950) — conductor and composer. With him she at last achieved some measure of popular success. After the tour she returned to Europe. She bough a studio and moved in who with her children. Then one day, after they had all been out, Isadora returned to the rehearsalstudio. The children were driven home in the limousine. Suddenly faced with a taxi, the driver stopped the car to avoid a colli­sion and stalled the engine. He got out to crank up the car but it rolled away from him, slid down the embankment and plunged back-words, in the Rive Seine. Her daughter and the nurse were killed. Her son was rushed to hospital but arrived too late to be saved. Isadora, who was then 35, was inconsolable. All of Paris came to the children’s funeral. Isadora’s life and art were scarred by the tragedy. She became restless, travelling to Greece and the Balkans before setting for a while in Italy. In January 1914, her six remaining pupils were reunited with her in France. Howev­er, the outbreak of World War I in August destroyed all her plans. At her lowest emo­tional ebb, she attempted to drown herself by walking into the sea, but was saved and sent away to the U.S. There she gave her first performance since the death of the children and was a great success. But the Americans still did not think her a suitable person to start a school. Disgusted with her fellow citizens’ lack of faith she left the country to go to neutral Switzerland. She left the girls there and began a tour of South America, from which she returned penniless. In September 1916, Isadora arrived back in New York, soon to be followed by her girls. The war ended in November 1918 while she was in the South of France. She still cherished hopes of founding a school but of the six girls, only one devoted soul, called Irma, remained with her. In 1921, Irma loyally determined to accompany her mentor to a terrifying new Russia. Isadora and her party arrived in Moscow on 24 July 1921 and quickly got into the revolutionary spirit. By November she had settled in and the government asked her to perform at the Bolshoi to celebrate the fourth anniversary of the Russian Revolution on 7 November. A few days later she met the man who was to make the greatest impression on her Russian years — Sergei Essenin*. * Essenin, Sergey Alexandrovich (1895-1925) — Russian poet. On April 1922, Isadora received news of her mother’s death her immediate response was to fly to France and then to America, tak­ing Essenin with her. But leaving the Sovi­et Union to enter the U.S. was no easy mat­ter. She was obliged to wed Essenin, and on 2 May 1922 the ceremony was performed. The couple went to Paris and, in October, to New York. Isadora’s few performances were sold out, but her insistence on making inflammatory speeches before each dance caused enormous trouble. The couple were forced to return to Paris, penniless and in disgrace. On 5 August 1923, after almost a year abroad, they returned to Moscow. The end of the relationship was only months away. Isadora threw herself into what remained of her work, touring the Ukrainian towns performing to folk­songs and revolutionary marches. Isadora’s next move was to Nice where she hired a building which she named the Stu­dio d’Isadora Duncan and to which she re­tired to write her long promised memoirs - an action primarily dictated by her peren­nial desperate need for money. On 12 September 1927, she went out for a drive in her stylish new Bugatti. It was a rather chilly evening and the driver sug­gested to I that she should wrap herself in cape to keep warm. Isadora settled her shawl around her neck and her shoulders unaware that the heavy fringe had fallen into the spokes of the wheel which had no mudguards. As the driver revved up the engine, the first revolution of the rear wheels broke her neck. Death was instanta­neous. She was buried in Paris on 19 Septem­ber at Pere Lachaise cemetery, beside her mother and her two beloved children. 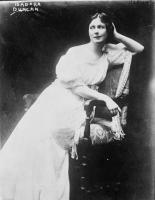 Isadora Duncan was American pioneer of “free” dance. Rebelled against stereotyped conven­tion of ballet with what she considered its con­tortions of the body and restrictive costume. She danced in filmy shifts, barelegged and barefoot, which added a sensational element to her reputation. Among the celebrated items in Isadora’s repertory were works danced to the music of such great composers as Brahms, Chopin, Thaikovsky, Gluck, Beethoven, Schu­bert, Liszt* and others. *Liszt, Franz (1811-1886) — Hungarian piano virtuoso and composer. She was a unique danc­er, a free ranging spirit and a passionate wom­an with a tragic destiny.